Claire Cook wrote her first novel in her minivan and walked the red carpet at the Hollywood premiere of the adaptation of her second novel, Must Love Dogs, starring Diane Lane and John Cusack. 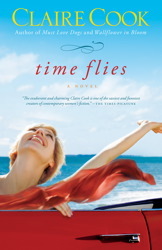 Her new novel Time Flies centers on a high school reunion, and she shares her insights and her characters’ here. She makes an entrance at every high school reunion. Impossibly tight dress, no visible movement to her face, elaborately foiled platinum hair, her emerald eyes a color that occurs naturally only in cats. She looks like she hasn’t eaten since the last reunion five years ago, and you wonder if her ordinary-looking husband is walking a few steps behind her to catch her if she falls off her 12-inch heels, or because his job is to record the stunned reactions of her classmates with his iPhone and play them back to her later. She hasn’t changed a bit. She’s changed completely. But guess what? She’s not having any fun. Her classmates check her out from a distance, and keep that distance. As they laugh and trade old stories and share pictures of their dogs and/or kids and/or grandkids, she feels as alone as she did back in high school. Even though her oldest and dearest friend B.J. is really pushing her to attend their high school reunion, Melanie, the narrator of my latest novel, Time Flies, knows exactly why she doesn’t want to go. 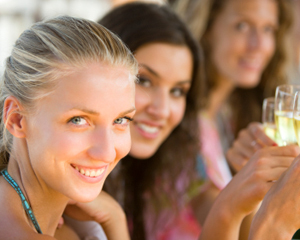 It’s so easy to fall into these high school reunion traps. You dedicate months of elaborate preparation trying to starve and coif yourself into someone you’re not. Or you don’t go because you think you won’t measure up. No matter how many chronological years we’ve put between high school and ourselves, class reunions can bring back the insecurity of that time in a nanosecond. Suddenly you’re checking yourself in the mirror for zits instead of crow’s feet and wondering if anyone’s going to ask you to the prom. So why put yourself out there again? Here’s the list B.J. emails to Melanie to talk her into going. I hope it works on you, too. 1. You’ll laugh like crazy. Who laughs enough these days? 2. You won’t have to wish you’d been there when you see all those pictures online. 3. It will give you fresh perspective and make you realize you’ve come a long way, baby. 4. You won’t have to lie about your age. Everyone there will be older than dirt, too. 5. You’ll regret not going more than you could possibly regret going. There’s a 16-year-old still buried in all of us, hoping someone will ask us to dance. Accept it. Know that it’s true for everybody. But don’t let it get in the way of a good time. Don’t diet. Don’t go under the knife for a high school reunion tune-up. Don’t freak out. Just jump in the car or hop on a plane and go. TWO BEST FRIENDS, A HIGH SCHOOL REUNION, AND A ROLLICKING ROAD TRIP DOWN MEMORY LANE YEARS AGO, Melanie followed her husband, Kurt, from the New England beach town where their two young sons were thriving to the suburbs of Atlanta. She’s carved out a life as a successful metal sculptor, but when Kurt leaves her for another woman, having the tools to cut up their marriage bed is small consolation. She’s old enough to know that high school reunions are often a big disappointment, but when her best friend makes her buy a ticket and an old flame gets in touch to see if she’ll be going, she fantasizes that returning to her past might help her find her future . . . until her highway driving phobia resurfaces and threatens to hold her back from the adventure of a lifetime. Time Flies is an epic trip filled with fun, heartbreak, and friendship that explores what it takes to conquer your worst fears . . . so you can start living your future.